Add subtle smoky flavours of lavender, quince and warm Christmas spices by stuffing your Christmas turkey with Macsween Three Bird Haggis. Three Bird Haggis was inspired by the popular Christmas roast of the same name and is a perfect accompaniment to your festive feast. The measurements quoted below are to stuff a 5-6kg free-range turkey which serves 8-10 people, but it is easy to change according to the size of your bird. In a frying pan, melt the butter with the olive oil and gently fry the onion over a low heat for 5 minutes until softened. Tip into a bowl and allow to cool before mixing in the remaining ingredients. As simple as that. And remember, you can buy a limited edition Macsween Three Bird Haggis here for delivery to your door. Order before 1pm Monday to Thursday and we can deliver the next day. 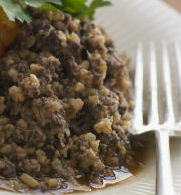 Next > Macsween Three Bird Haggis and Venison Haggis is here!